Within the last year, the City of Grandview unveiled a new tagline. With new developments, growth, and opportunities, city officials decided it was time to give the city’s slogan a new sense of pride. 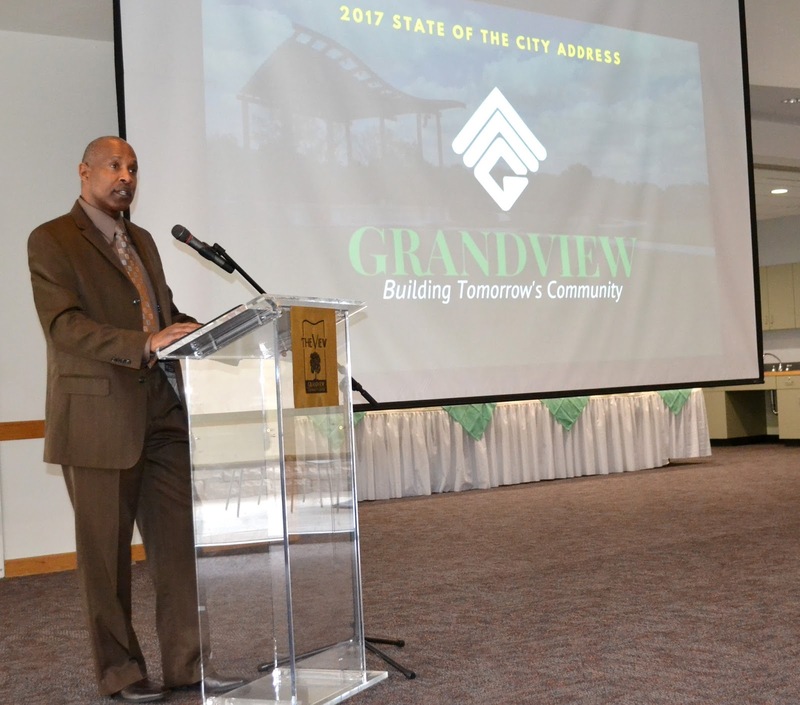 “Building Tomorrow’s Community” was selected, and in his State of the City address last Thursday, January 26, Grandview Mayor Leonard Jones relied heavily on those three words. 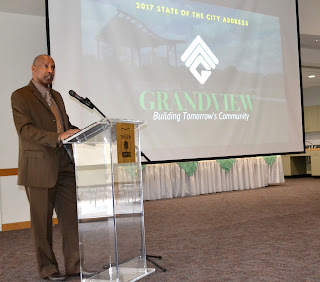 He added that the transformations seen in Grandview have received attention from other municipalities across the metro. According to his address, in 2016, Grandview’s department directors had a lot on their plates. A goal was set with City Administrator Cory Smith and each department head to complete each project on-time in 2016 and begin 2017 with those accomplishments finished. These accomplishments included: Truman’s Marketplace redevelopment, the groundbreaking for Gateway Sports Village, the Blue Ridge Shopping Center is under new ownership and updates are underway, the opening of the new Grandview Amphitheater, and 5,500 building permits have been issued within the last six years generating $1.3 million and $137 million of new construction. Upcoming projects could include additional developments along the 150-Highway corridor, the former K-Mart site along I-49, 300 new apartments at Grand Summit, Gateway Village developments taking shape, a Jack-in-the-Box restaurant added in Truman’s Marketplace, and Waffle House on Main Street will be rebuilt in its same location. The Grandview fire department in the last year has refurbished a ladder truck, purchased a new pumper truck, remodeled two fire stations and expanded fire prevention efforts in the city. Public Works completed phase four of Main Street improvements and the interconnection of the Frontage Road at the I-49 and 150 interchange. The city also received a grant to extend public bus service to Main Street in Grandview and funding to replace the Kansas City Southern Railroad bridge over Blue Ridge Boulevard. Construction is underway at City Hall for the police department’s storage facility. The department also purchased new AEDs and overdose medical kits for every patrol vehicle. Since 2010, major crime in Grandview has been reduced by 17%. Police Chief Charles Iseman continues to press community outreach as a priority, and encourages his officers to get out of their vehicles and engage and interact with kids. “We want kids to feel comfortable and move toward the badge, not away from it,” said Iseman. Mayor Jones ended by saying 2016 was a full year. He said that in 2017, the community will see increased safety for residents and families, good schools, quality places to work, shop, eat and play. He added that progress will continue into the next year, with Missouri Department of Transportation beginning work on the Main Street bridge replacement. The 155th Street widening project begins this week, and the Presidential Trail will be under construction. In August, the City will once again ask Grandview residents to renew the capital improvement sales tax, previously approved by voters in 1998 and in 2008.